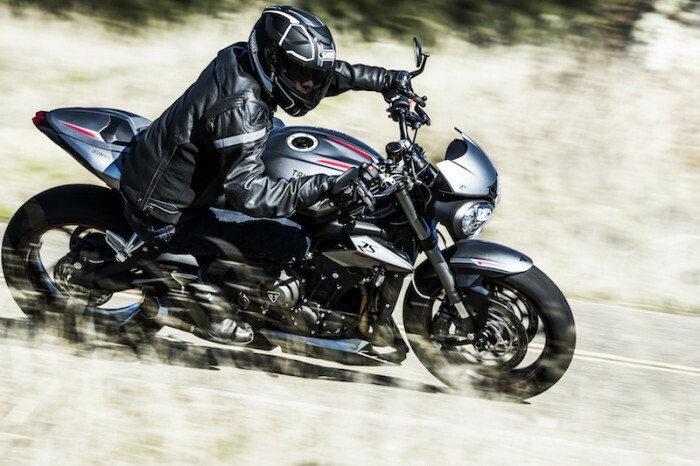 Hinckley firm Triumph launched its new Street Triple today, at a flash event in London’s Olympic Park. The new bike uses a heavily-updated version of the old 675cc three-cylinder 12v engine, in a revamped chassis, with all-new running gear, electronic aids and styling. And the new bike comes in three different versions – a base S model, a flasher R, and the top-of-the-line RS. The base bike has less power, 111bhp compared with 116bhp for the R and 121bhp for the RS, and a lower spec chassis and equipment. The new engine is lightly based on the old motor, but almost everything has been changed. They’ve moved from iron liners to a Nikasil-coated block, and both bore and stroke are increased to give the 765cc capacity. Rods, crank, head are all new, and the gearbox is also heavily revamped. On the chassis front, there’s a new swingarm (the main frame is similar to the old bike), and flash new suspension and brakes. The RS gets the best kit of course: Showa BPF forks up front and an Ohlins STX shock out back, with Brembo M50 front brakes. The R has Showa Separate function BPF forks, and a flash Showa shock, plus Brembo M32.4 front calipers. Meanwhile, the S has cooking Showa SFF forks and basic Showa shock, plus Nissin sliding front brake calipers. The R and RS share a top-spec colour TFT dashboard, with stacks of customisation options, while the S gets old-school analogue tacho and greyscale LCD panel. The riding mode options are also fancier as you go up a spec – the RS has a Track mode for the ABS and traction, the R has a Sport mode, while the S just gets Rain and Road modes. So – you get the picture. A super-trick RS version at the top, with a basic model for riders on a budget, and one in the middle. Options to suit everyone, from novices and commuters, to flat-out naked bike trackday fans. The bikes will be launched next month, and in the dealers from March. No price for the flash models as yet, but the base bike will start at £8,000. Of course, the big question was about Moto2 – and Triumph’s contract to supply the 765cc triple engine as the control motor for the series. But Triumph bosses were tight lipped in public, refusing to comment on what they called ‘speculation’. But it seems that there’ll be an official announcement at the first MotoGP round of the year, in Qatar.